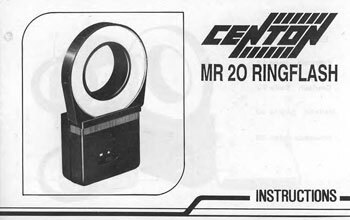 Are you looking for an instruction manual for a Centon MR20 Ringflash? If so you’ve come to the right place. To download right click on the link below and save to your computer. This book will also suit people looking for the Vivitar Macroflash 5000 or the Starblitz 1000 Ringflash or the Cobra Macroflash as they are from the same factory. Posted: October 22nd, 2010 under Instruction manuals.